Home sport Intercontinental Cup: Learn About Sunil Chhetri’s Prowess Both On And Off-Field! Intercontinental Cup: Learn About Sunil Chhetri’s Prowess Both On And Off-Field! If you are not living under a rock, you know by now that the 33-year old Sunil Chhetri is currently the pride and joy of India, and not just because he is the Captain of the Blue Tigers. Have you seen the recent headlines? Chhetri, with India’s win against Kenya, is now tied with Messi in the list of all-time goal scorers. Chhetri’s second goal in the match against Kenya helped him secure his 64th goal and climb up the list. Chhetri’s 64th goal puts him just one goal away from the former Chelsea star Didier Drogba. Chhetri, who has now played 103 matches, is the second Indian player, after Bhaichung Bhutia, who has featured in a hundred International events. Currently, both Messi and Chhetri are still a long way away from the famed Portuguese star Cristiano Ronaldo, who has secured 81 goals in 150 matches. However, these players’ accomplishments in the field are nothing to be scoffed at! However, it may be noted that although Chhetri may not have been able to beat Messi and Ronaldo concerning goals scored, he has undoubtedly surpassed them regarding his goal average. Chhetri currently has a goal average of 0.62 per match, while Messi’s goal average is 0.52 and Ronald stands at 0.54. 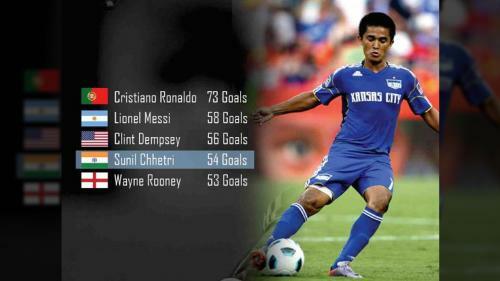 With such statistics, it can arguably be said that currently, Chhetri is one of the best players on the field, isn’t he? The Blue Tiger Fans Poured Into The Stadium In Support Of Their Favorite Captain! Chhetri’s win against Kenya was not only a pivotal point in his career, but this matched helped him keep his promise of not disappointing his fans. Though India opened the games tremendously with their 5-0 win against China, it seemed that the moment lacked a certain spark because of the absence of Indian fans in the stadium. Seen his heartfelt message for fans? Before the match against Kenya, Chhetri took matters in his own hands and requested his fans to fill the stadium in a show of their support. As expected! The fans did not disappoint the captain, and the tickets were sold out hours before the match. The game that followed was definitely worth the audience’s while, wouldn’t you agree? Even after India suffered their recent loss against New Zealand, Chhetri did not lose his spirit. After the match, he thanked his fans for their love and support. In fact, during this time he even spotted a disabled Blue Tigers loyal, whom he presented with his armband. Though India now seems to be in a dicey second spot, Chhetri has managed to be gracious and not lose hope. With both New Zealand as well as India being on 6 points, the match between Kenya and China this Friday are sure to be nerve-wracking for the fans of the Indian team! Stay tuned for more match updates!